How does Face-ID work at events? Internationally, the system was already successfully used at events last year. In Germany since the beginning of the year. The acceptance of the attendees is consistently positive. The system is primarily used for security at events and to significantly speed up registration processes. Because surely nothing is worse for you as a guest than queues. Of course there is also the possibility to work with QR-Code tickets or via name search. However, this is precisely where the problem of waiting arises. You can search for QR codes, browse through email or just search for the name. This causes traffic jams. The face, you always have with you and is a clear marker! You smile nicely into the camera - and hold your badge in your hand the next moment - within 8 seconds. Face-ID can also provide more security for you as a attendee at events with high security requirements. Due to the uniqueness of the facial biometry, the organizer can ensure one thing: Only those guests who have been invited to the event will attend. The passing on of QR codes, vouchers or tickets can be avoided. How does the upload of the photo work in detail? The creation of the Face-ID is only a small, additional step in the online registration. For you, nothing will change in the registration process at first. Communication between the organizer and you as an attendee is always important. You need to know what happens to your photo, why it makes the registration process easier and of course you need to give your consent. Here we help with pleasure so that everything runs smoothly. The Face-ID service is integrated into the registration process via email campaign. This means that you complete the online registration as usual. Afterwards you will receive an email with a personal link via which you can temporarily upload your photo. The software then calculates the biometric profile and encrypts it. The process takes a few seconds - your photo is never saved! At your event you come to the registration and just look into the camera. 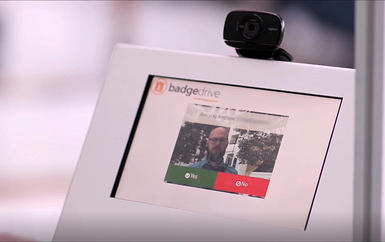 The software compares the recorded data with the stored biometric profile and the badge is printed. No photo will be taken on site. The adjustment is performed live. What do I do if I don't want to upload a photo? Of course, you can also register conventionally, simply do not check the box "quick registration with Face-ID" in the online registration. You can then simply log on to an extra desk for "conventional" registration as usual. Here you can register either with a QR code or with name. However, most participants find Face-ID exciting and simple and would like to try it out. And what about data protection? First of all, what are biometric data? Biometric characteristics are personal information on the physical, physiological or behavioural characteristics of an identifiable person. These include, for example, DNA, facial geometry and fingerprint. The biometry of a face is unique. Our technology calculates these from the temporarily provided photo. Therefore, it is also a unique marker. We store biometric data in the form of an ID number and encrypt it. This ID cannot be read by third parties. Furthermore, we never store a photo at any time. When you come to the event, the camera takes a live image from which the biometric data is also determined live. We then compare this with the stored biometric ID. After the event we delete all biometric data from our server. Another security aspect: The biometric data is stored on a different server than your personal data, which is stored in the online registration. Personal and biometric data are never stored on the same system. And of course all processes are optimized and set up according to the current requirements of the GDPR and corresponding contracts have been concluded.